You gotta be kidding me! Only 13 Inform games, and no TADS?!! Is this an IFComp? I suppose it’s possible that one of those “Web” games has a good parser, but I won’t be finding out. The only question I have now is whether to 1-vote the non-IF games, or not vote on them. The good news is, I ought to be able to play all 13. Why all the hate? For context, a brief history lesson. Choice-based gamebooks, such as the Choose Your Own Adventure books. Text adventures and gamebooks retain an active creator audience and fanbase, though they are (for the most part) no longer commercially viable. Their wide-ranging descendants include multi-user dungeons, visual novels, hyperlink fiction, and a variety of adventure games. The choice-based IF community used to be small, because every creator generally wound up rolling their own engine and getting lost in the details. However, in 2009, Chris Klimas created an open-source tool called Twine. With its visual editor and active community, Twine gains followers daily. 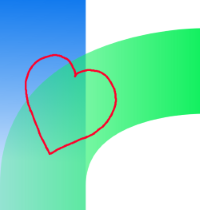 The parser-based IF community survives as a small, enthusiastic group. Tools for writing parser IF get better every year, with the most popular being Graham Nelson’s natural language design system Inform 7. Despite the hobbyist nature of the parser community, quality standards have risen far beyond the standards set in 1983. Unfortunately, the parser-based IF community is rather insular. While some of the best-known parser IF authors (Emily Short, Andrew Plotkin, Aaron Reed) are vocal in their support for non-parser IF, other longstanding community members are fervently hostile. The problem is, that hostility can have a real effect. 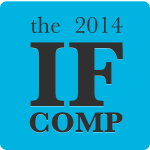 The IF community is not terribly large, and IFComp is a publicly judged competition. To prevent it from becoming a popularity contest, authors are forbidden to canvas for votes. People who want to show up and judge, show up, and people who don’t, don’t. That threat in the quote above? The 1-vote threat? Within IFComp, it’s a big deal. Games win and lose on very tight margins. If you receive 200 votes, and 10 of them are deliberate attempts to spike your score, it will hurt you badly. The people threatening 1-votes are doing so out of fear. IFComp used to be a purely parser phenomenon, and yet 13 out of 42 entries are choice-based this year. They fear that the rise of choice-based games (especially Twine) will destroy parser IF forever, and that fear leads to hostility. I welcome people who want to make interactive stories. Is it a story? Is it interactive? Is it text-based? Then as far as I’m concerned, that game belongs in IFComp. I make parser games, for the most part. I make parser games because I love parser games, and the parser format is often the best way that I see to tell the interactive stories I want to tell. I also make parser games because I know Inform 7 better than any other IF engine. I’ve repeatedly made games that “should have been” choice-based games in parser (Wildflowers, Fish Dreams, What Are Little Girls Made Of?) because I know that format best. I presume that people who are working in a choice-based medium are doing so because it is the best way to tell the interactive stories they want to tell. Choice of the Deathless wouldn’t work in parser. Neither would Cis Gaze. Neither would their angelical understanding. People who are working in Twine may make choice-based games because they know a choice-based system better than any other medium. Their decision is valid, too. And their games belong at IFComp every bit as much as mine do. I care about games as a medium, and I think everyone should have the ability to make games if they want to. Twine is bringing the ability to write IF to people who didn’t have it before, and bringing the ability to everyone to make new kinds of IF that weren’t possible before. Twine is a good tool, and I am glad that Twine exists. I write parser games. I show people how to make Twine games. I play interactive fiction of all kinds – not just Zork and Wishbringer and Hitchhiker’s, but Device 6 and Coming Out Simulator 2014 and Trapped in Time and 18 Cadence and more than I can list. There is room in my worldview and my community for more than one kind of interactive fiction. I welcome people who want to make interactive stories. I want to play their games. I want to be part of a community where we all make interactive stories together. How did I not know about your blog until now? You are the hero we need and the hero we deserve. I completely share your opinion, parser-games as well as CYOAs are both valid (and enriching) parts of IF today. However (and this may’ve been discussed before very often) what do you think about splitting IFComp into 2 distinct sections, one for traditional parser-, one for non-parser games? I don’t think splitting IFComp up by parser/non-parser would be helpful. Many games hybridize the two, such as Wildflowers (a parser-engine game that implements a CYOA interface) or Xenobabysitter (a Twine game that implements a parser-style map). There are also games that stretch beyond those definitions, such as Renga in Four Parts, Trapped in Time, Fallen London, or Device 6. These are undeniably interactive fiction, but they don’t really fall into either category.